not perish but have eternal life." The Bible's message is God's message. We know that because the Bible is "inspired." "Inspired" can mean many things. Some people think it means that it "is interesting" or "fascinating." Certainly, the Bible does "inspire" us and give us joy. "Inspiration," however, refers to the fact that God caused or "Breathed-in" ("inspired") the Bible. That means that every single word of the Bible is God's Word, not words invented by humans. Many Christians don't believe all the Bible is God's Word. This is because they don't want to listen and obey God in everything. This is exactly where Satan wants them. Whenever we deny God's Word, we disobey God by making our words more important that God's Word. The purpose of the Bible is to show us how to be saved and how to live a Christian life. The Law tells us how to live our lives. This is the first major teaching. We find the Law of God throughout the Bible. 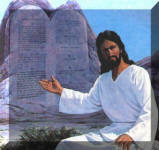 The best example of God's Law is in the Ten Commandments (Exodus 20; Deuteronomy 5). Promises that we will die for our sin. The most dangerous mistake any one can make is to confuse Law and Gospel. How can you tell is someone is confusing Law and Gospel? Just ask this simple question: "How are you going to heaven?" 1) Some say they will get to heaven because they are good people. Wrong! By completely eliminating Jesus' forgiving work on the cross, they believe they are saved completed by keeping the Ten Commandments. Unfortunately, the Bible says, those who believe this are going to hell. 2) Some people believe Jesus died for them, but He didn't completely save them. Since Jesus' sacrifice wasn't enough, they must do good things to be saved. This belief, too, confuses God's plan of salvation. As the Bible says, unless Jesus is our only Savior, we are going to hell. Those who want, by their own good works to "help" Jesus, are not Christians. They deny the Gospel and are in danger of eternal damnation. The good works we do are simply the way we thank God for salvation in Jesus Christ. St. Paul wrote that our good works are the way we live out God's calling for us that He planned for us before He even created the world. What did God plan for you to do before the world began? Are you ready to do what God called and prepared you to do?